The Jeep Compass is a great compact SUV that has the abilities of a Jeep Wrangler with a style closer to the Jeep Grand Cherokee. It can handle terrain like all of the other Jeeps, but it gives you more of the luxury and comfort features that you enjoy. There are many reasons to love the Jeep Compass, but there are several reasons that stick out from the rest. 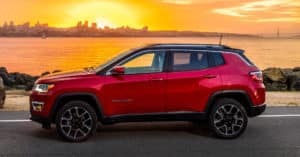 If you are looking for a highly capable compact SUV, then here is a look at the top four reasons to love the 2018 Jeep Compass. Like the other Jeep options, the Jeep Compass has extreme off-road capabilities. With the 4×4 systems that Jeep developed, the Compass is capable of climbing and descending steep inclines, as well as climbing over obstacles like fallen trees. Part of that ability comes from the Selec-Terrain Traction Management System which gives you control over the powertrain and traction settings. You can select between four different drive modes for different terrain options. That way, you can be sure that you get the best performance out of your compass no matter where you are. The Jeep Compass makes a great family vehicle since it has been redesigned to improve your driving safety. The refinements include a new reinforced steel and aluminum frame with added protection for key areas, as well as a full covered airbag system. You’ll be protected from all sides at all times. Over the last decade, Jeep has been developing new safety systems that help you avoid car accidents. These new systems include the LaneSense Lane Departure Warning with Lane Keep Assist and the Forward Collision Warning System with Active Braking. The Forward Collision Warning System is designed to monitor for imminent collisions with cars in front of you and to activate the brakes automatically to help you avoid an accident. The Lane Departure Warning system watches for when you begin to drift out of your lane, and helps you get back in your lane safely. These systems are great for helping you avoid accidents because of simple mistakes. Your Jeep Compass can take advantage of new services like SiriusXM Guardian, which lets you monitor your Compass through your smartphone. You can do different tasks like check to see if your car is locked, lock it remotely, and monitor its location. You can also get help through roadside assistance or use navigation features to figure out where you are going. The 2018 Jeep Compass can make a great family vehicle or off-roading vehicle based on what you need and how you use it. With the features of the Jeep Compass, you are able to have a more enjoyable driving experience every time you get on or off of the road. If you like what the Compass has available, you should stop by Eastgate Chrysler Jeep Dodge Ram to test drive one today. The Jeep experts there can help you see how a new Jeep can make a big difference in how you drive.